Would you like to get to space, but you don't have the $20 million for a ticket to the space shuttle? 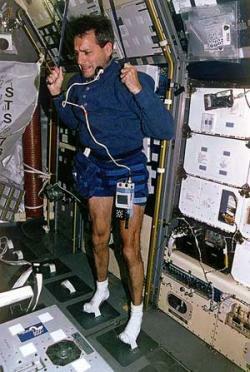 Researchers from Ball State University in Muncie, Indiana, and Marquette University in Milwaukee, Wisconsin, compared the exercise records of four male astronauts on a 1996 shuttle mission with those of eight men confined to inclined beds. The eight men performed essentially the same mission activities as the astronauts over a 17-day period. The researchers found basically the same effects in both groups; cardiorespiratory function and their ability to exercise saw similar declines. So, if you would like to have that true space experience, all you need to do is stay in a bed the head of which is six degrees lower than the foot for a suitable period. "This 6° head-down tilt does appear to mimic the responses to spaceflight very well," said exercise scientist Todd Trappe of Ball State University. "By being in space and floating around, your body deteriorates and, as a result, when you return to a gravitational environment, your body is not up to the task." This research has a practical value; it allows scientists to improve upon existing exercise routines that astronauts perform in space to maintain their fitness for the rigors of the return to Earth's gravitational field. NASA, the European Space Agency and the French space agency CNES have recently completed a 60-day inclined bedrest study of women to simulate a two-month spaceflight. I don't have an exact science fiction reference for the bedrest idea. However, I was thinking about the ways that other people identify space travelers. In science fiction writer Robert Heinlein's 1941 novel Methuselah's Children, groundhog (Earth person) Mary Sperling notices Lazarus Long's "spaceman's tan" and becomes interested in him. Astronauts are a fairly macho bunch; but when real-life astronauts come back from an extended stay in space, they are pretty much basket cases due to muscle fatigue. Now, if a guy were to simulate this loss of muscle tone by, say, staying in a six degree inclined bed for a month or so, women might find him more attractive? On second thought, never mind. Read more at just lie down.